Mk-I High Concentration PhotoVoltaic (HCPV) panels supplied by OPEL. announced that it has begun supplying OPEL’s HCPV panels to build a utility grade solar power plant of 440 kilowatt (kW) in Spain under an agreement with BETASOL. When completed, the grid is expected to supply cost effective and energy efficient power to over 500 households. BETASOL is a Spanish company located in a prime area of Spain for solar deployments. Its business is building utility grade solar farm installations and their subsequent sale to investor groups. 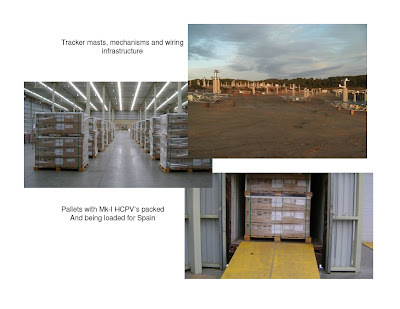 OPEL claims Mk-I HCPV panel (Mk-I datasheet) shipments for the Spanish installation began in December 2008, and the project is slated for first quarter 2009 completion. No information has been provided on the trackers used in the project other than the OPEL supplied photo arrangement below. Per OPEL, the project is located about half way between Barcelona and Zaragoza (Saragossa), Spain. Since this is the first significant HCPV deployment for OPEL, I wanted to investigate their partner, BETASOL. Although the press release includes a quote from Jesus Cabetas, Managing Director of BETASOL, I was not able to contact BETASOL to confirm this agreement. “OPEL Installs 9.5 kW Solar System” at The Sports Zone in Trumbull, Connecticut USA not far from the OPEL headquarters in Shelton, CT.
A twitter widget has appeared like magic in the Blog sidebar! I am experimenting with twitter at http://twitter.com/edgunther. Follow or send me a tweet. Although I have hooked in twitterfeed for Blog posts and I send occasional solar tweets, there are things besides photovoltaics to tweet. Indeed! ← Solar Grant: What is a Refundable Renewable Energy Tax Credit?